Coated Abrasivesconsist of a backing material - typically, Paper, Woven Cloth, Cloth/Paper Combination, Polyester Film or Vulcanised Fibre, to which is bonded one of the abrasive grain types listed in our Abrasive Grain Technologies section. An initial 'Make' coating of resin is applied to the backing, the chosen abrasive grain is then electro-coated onto the surface, followed by a second or ' Size' coating of resin to lock in the abrasive particles. 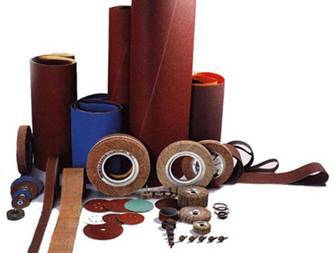 Following an oven cure the resulting materials are converted into various forms, shapes and sizes of Belts, Rolls, Discs or Wheels to Grind, De-burr, Finish and Polish products in a vast range of applications.